This morning, our great new General Manager of the city's Information Technology Agency, Randi Levin (who came to us after heading up IT for NBC/Universal), invited me to address the employees of the department and to share some of my vision for using technology to improve the lives of Angelenos. I thanked ITA for all that they have done to innovate and to provide services to our city. From our early leadership with e-permits (we have given out more on-line e-permits than any other local government in the country) to our new archived video coverage of the City Council meetings, ITA has proven itself. Earlier this year, I was proud to be honored by Government Technology as one of the nation's "Top 25 Doers, Dreamers, and Drivers" working on technology in government today and I was pleased to accept the award from the Center for Digital Government for one of the nation's top three local government web sites on behalf of the city in 2005. 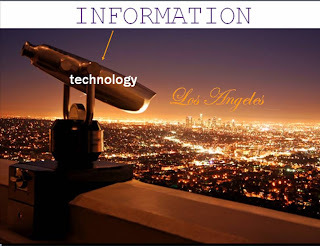 I have been able to help use technology to connect Angelenos to the city services they need because of the great personnel we have at our Information Technology Agency. If you have any good ideas for us, please let us know, so we can keep moving Los Angeles forward. Thanks to everyone who came out to a super parade on Sunday! We had a wonderful crowd--police estimated that at least 120,000 parade-goers lined Hollywood Blvd., Vine St., and Sunset Blvd. to watch the parade and to continue the tradition. The celebrities who were so generous with their time, the bands who performed beautifully, and the city staff (especially my Deputy Chief of Staff Ana Guerrero) and Santa Parade, LLC folks that helped pull this off with only three months all deserve many thanks. Special thanks, too, to Greg Durfee, who visited City Council as Santa many months ago and asked us to save the parade. He was a great help and it was very nice to see him at the parade (pictured left). The Daily News wrote an editorial this morning about the parade that captured the civic spirit of this parade, which I call the people's parade. You could see the holiday excitement it in the eyes of the kids along the route when Santa finally appeared. We will certainly build on this year's experience to continue to keep the tradition alive and improve the parade each year, but congratulations to the community and thanks to everyone for stepping up to keep the parade alive! On Monday night, we welcomed hundreds of kids and kids at heart to the Chinese Theatre, where the Hollywood Chamber of Commerce Community Foundation and Hollywood Heritage put together an unforgettable evening that brought together Hollywood's unforgettable past with its living present with a screening of a restored print of the Wizard of Oz. Joining us for this special screening were seven of the last nine surviving actors who played the Munchkins in this timeless classic. The Wizard of Oz first premiered at Grauman's Chinese Theater on August 15, 1939, and being in the original theatre made the night very special. The actors that played the Munchkins spoke on a panel that preceded the screening. In one of my favorite moments, Meinhardt Raabe, who played the Coroner, re-affirmed about the Wicked Witch of the West that the "As Coroner, I must aver, I thoroughly examined her, And she's not only MERELY dead, She's really most SINCERELY dead." I gave each of them a resolution on behalf of the city and had a wonderful time at the movie. 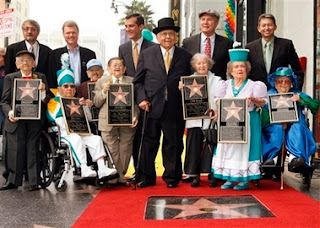 The next day, the Munchkins came back to the Chinese by horse-drawn carriage as the Walk of Fame was transformed into the Yellow Brick Road and on behalf of all 124 Munchkins, they accepted the newest Star on the Walk of Fame. The Cirque is coming to town! Yesterday, I joined Guy Laliberté, founder of Cirque du Soleil, Mayor Villaraigosa, and the owners of Hollywood and Highland to announce that Cirque du Soleil has agreed to develop a show that will be in residence in the city-owned Kodak Theatre for at least a decade. Los Angeles has an important role in the history of Cirque du Soleil. Twenty years ago, when Cirque was on the brink of closing down, they came to Los Angeles, where the city embraced them and, as they say in Hollywood, the rest is history. Yesterday, on the 20th anniversary (almost to the day) of that turning point, Cirque committed to Los Angeles to creating one of the best shows ever made. The show will draw upon the history of Hollywood and moviemaking. The Kodak Theatre will continue to host our modern-day history-making Academy Awards (and the Cirque show will go dark for 4-6 weeks each year to accommodate our friends at the Academy), and for the rest of the year, starting in about 2010 (it takes usually 2-3 years for Cirque to create a show from scratch), we will have the world's premiere live performance stage company in residence. Guy made clear his commitment to Hollywood and the people of Los Angeles and Cirque has a great reputation for its socially-responsible philosophy, reflected in everything from its local youth job training (for years they have been working with homeless youth at My Friend's Place in Hollywood) to using no animals in their shows and much more. Guy also mentioned that the Hollywood renaissance and the city's investment in the beautiful Kodak Theatre, which brought the Academy Awards back to Hollywood, was a big reason for their decision to create this show. Welcome to Hollywood, Cirque du Soleil! It's great to know you will be staying for a while. Be sure to see the Los Angeles Times' piece on Green Building this morning. I have been working very hard with Mayor Villaraigosa and the green building, environmental, and development community to craft new building regulations and incentives to help Los Angeles reduce its energy and water use, and to lessen the amount of waste that comes from construction. Congratulations to the LA City Planning Commission for passing a great package yesterday and I hope that any of you with further suggestions will weigh in before the legislation reaches council. Ever wondered how much of the earth's resources you consume? Since 2003, I have served alongside environmental pioneers like Nobel Peace Prize Winner Wangari Muta Maathai, Scientist and Pulitzer Prize Winner E.O. Wilson, and former Costa Rican President Oscar Arias on the advisory council of the Global Footprint Network, the international organization that pioneered the idea of the ecological footprint. The ecological footprint measures how your personal behavior and lifestyle impacts the earth's resources. If you are curious where you rate, take the Ecological Footprint Quiz. Recently, we launched a new blog at GFN. 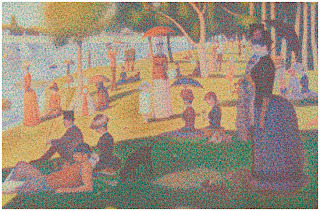 Check out recent postings on Ecological Debt Day (the day in which human beings have consumed the resources that were produced on earth this year--it was October 5th this year), Utah's achievement of becoming the first state to measure its ecological footprint, and photographer Chris Jorgan's photos on America's patterns of consumption (like the Seurat Painting to the right made with a representation of the 106,000 aluminum cans we consume in this country every 30 seconds). I am working on ways we might be able to measure the ecological footprint of Los Angeles, so stayed tuned for more. In the meantime, enjoy the new blog. 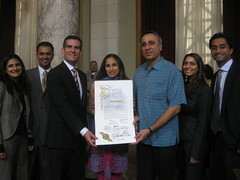 Today I had the honor of making the first-ever presentation in L.A. City Council Chambers recognizing Diwali, the festival of lights that marks the beginning of the new year for many Hindus and is celebrated by South Asian Americans across the country. I have traveled to India during Diwali and it is truly an incredible and marvelous experience -- something I will never forget. This is a good time for all of us to reflect and a time for all of us to let the good inside win over evil and to receive the knowledge that wins over the darkness of ignorance. Bob Barker, come on down! You're the next Grand Marshal of Hollywood's Santa Parade! Hollywood Boulevard has long symbolized a place where people come to make their dreams come true. In just a few weeks, thousands of kids will come to Hollywood Boulevard in hopes of asking Santa to make their holiday dreams come true. When I heard that for the first time in 75 years the Hollywood Chamber of Commerce would not produce a holiday parade, I knew we couldn't let this tradition die. 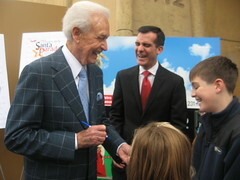 Today I was happy to announce that not only is the parade going to continue this year, but we have a terrific Grand Marshal in legendary television personality Bob Barker. The parade will be on Sunday, November 25, beginning at 5 p.m. The route begins at Hollywood and Highland, making it convenient to take the Metro Red Line to the parade. For more information, visit the Hollywood's Santa Parade site. 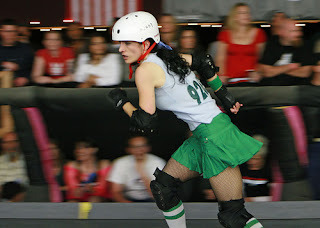 Around the world, Los Angeles is synonymous with the entertainment industry. It's part of our culture and a big part of our economy. This writers' strike is about so much more than just one industry -- it impacts our entire city. Earlier this week, I was talking to a florist who owns a shop in Silver Lake. He is really worried that a lengthy strike could be harmful to his business. Today, I introduced a resolution in City Council to urge both parties to come back to the table and resolve this quickly. It also offers city facilities, free of charge, as a neutral meeting place. Several writers came to testify in favor of the resolution. Writer Patrick Massett said, "We want everyone to be working. It's about our future. It's about our families." I want everyone to be able to go back to work, too. The resolution passed unanimously, and I will be doing everything I can to urge the parties involved to resume discussions.